It sounds bizarre, but my first thought upon arriving in the main town in Gdańsk was that the city looked like a bag of jellybeans. I don’t mean that it was made of soft squishy lollies – that would be ridiculous. It was the colours. Each building in the streets of the main town is a different colour, and it made me think of those walls in sweet shops where they have twenty something different flavoured jellybeans, and you have a scoop and a bag to choose what you want. I that every building has a pointy roof, but a different facade to its neighbours. The sky looks as though it’s being pierced by the tip of each brightly coloured house. It’s beautiful. I fell in love with Gdańsk in a heartbeat. 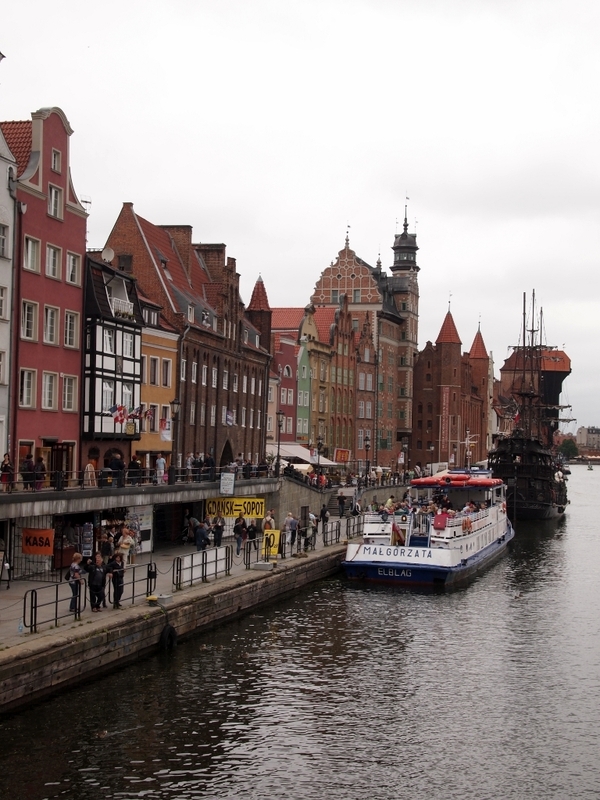 Gdańsk was my starting point in Poland, and I hadn’t felt this excited about a place since arriving in Tallinn. Despite the fact that I was exhausted, having been unable to get much sleep on the overnight bus from Lithuania, and just wanted to get to the hostel and have a shower – long bus/train/plane trips makes my skin feel horrible – I couldn’t fail to appreciate the beauty of the architecture even in my only marginally awake state. Feeling slightly more human after breakfast and a shower, I headed out to explore the city of jellybeans. 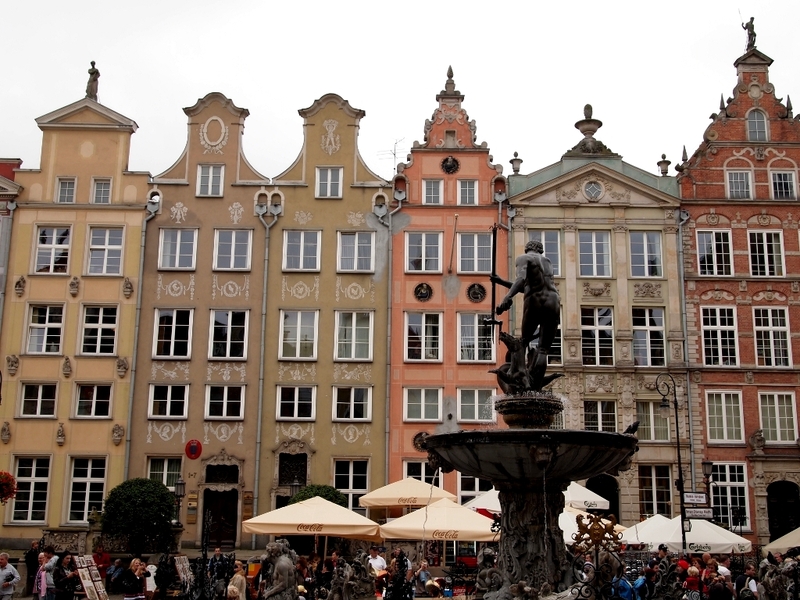 One thing that I did know about Gdańsk is that it wasn’t always a Polish city. 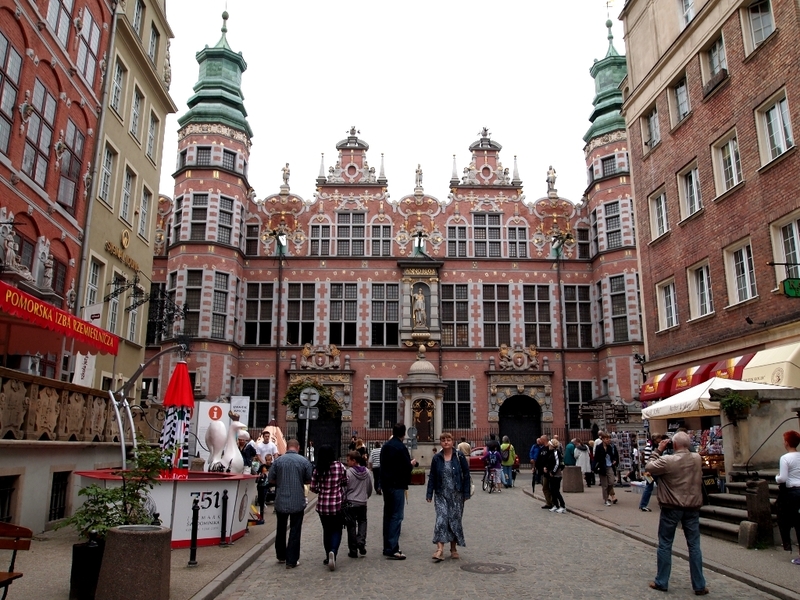 Over the centuries it’s been part of Poland, Germany, the Prussian Empire, and a free city for a few years. It’s gone back and forth between various powers, as Poland has been partitioned by various nations a number of times. 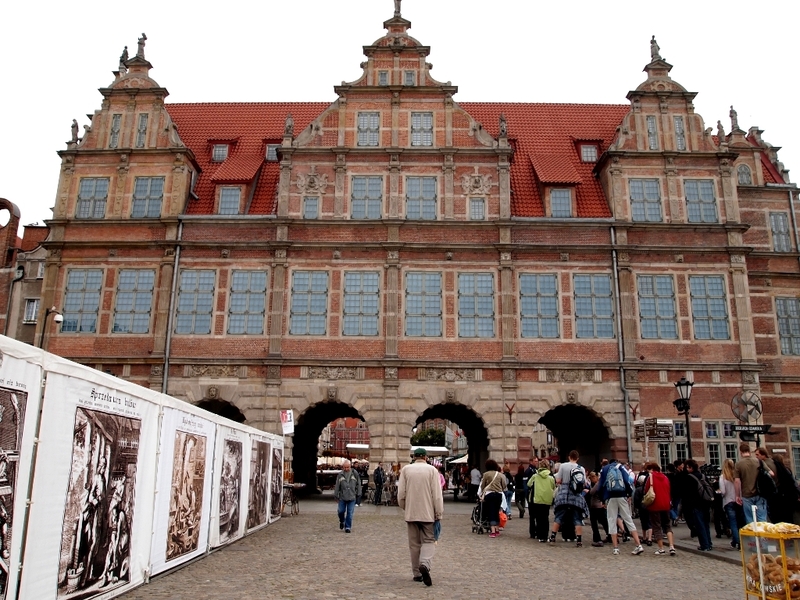 Basically, for the past couple hundred years, Gdańsk, called Danzig, has been a German [Prussian] city. Between the two world wars, Danzig was a free and autonomous city, retaining however close ties to Poland which had a bunch of complex rights to Danzig which I don’t quite understand. The city was ceded to Poland after WWII, when the country lost most of its eastern territory and received basically what is the western half of present Poland in ‘compensation’ of sorts. Renamed Gdańsk, the city was quickly populated with Poles migrating from Polish speaking areas east of the Curzon Line which had been annexed by the Soviet Union. When I was in Lithuania, I spent five days in the capital, Vilnius. Up until the end of WWII Vilnius [Wilno] was a Polish city. 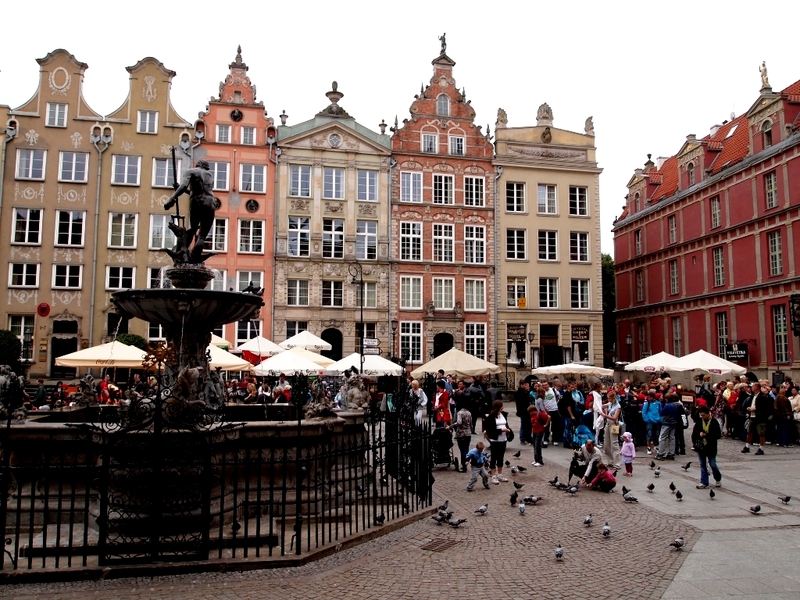 Everyone I met there would remark on how Polish the city was, architecturally. Gdańsk looked completely different to Vilnius, because it’s spent quite a lot of time being a German city. 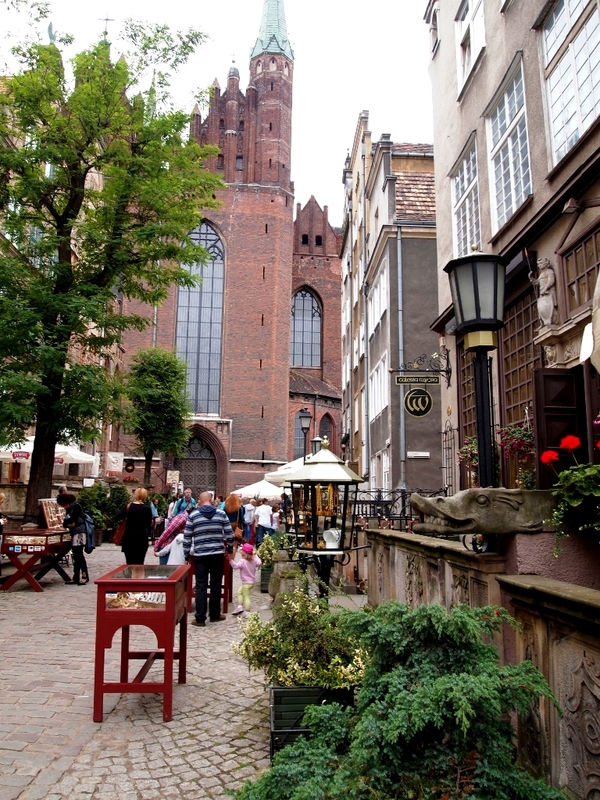 In Gdańsk, there are two ‘parts’ of the city that are of interest to tourist. There’s the ‘Old Town’, which dates back to the thirteenth century or so, and the ‘Main Town’, where a lot of the buildings date variously to the sixteenth to eighteenth centuries. Basically, the Main Town is a little ‘newer’. The Old Town was almost completely destroyed during WWII, while the Main Town suffered significantly less damage. The Main Town looks like jellybeans, while the Old Town has some beautiful old churches in the middle of giant shopping centres and squat Soviet buildings. The Main Town is where the magic’s at. 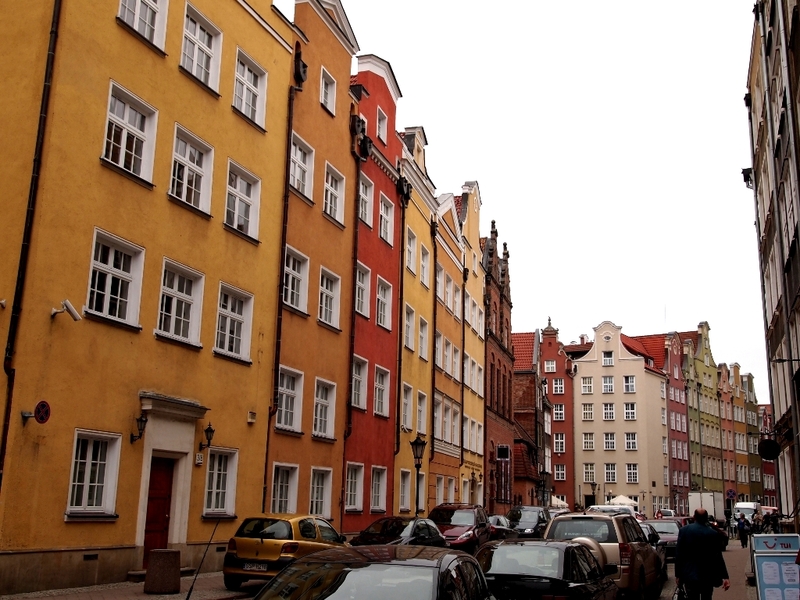 My first few days in Gdańsk were spent wandering around aimlessly, walking up and down the streets marvelling at the architecture and the colours. From the hostel I would walk along the river, past all the overpriced restaurants and souvenir stalls selling everything from chunky mugs to Polish flags to tacky postcards, past the little amber galleries, enjoying watching the ferries pull in and avoiding people handing me all sorts of advertising brochures in Polish. You can’t miss the 15th century Gdańsk Crane, the largest in Europe at that time and capable of lifting 2000 kg. It looks out over the water, and is now part of the maritime museum. 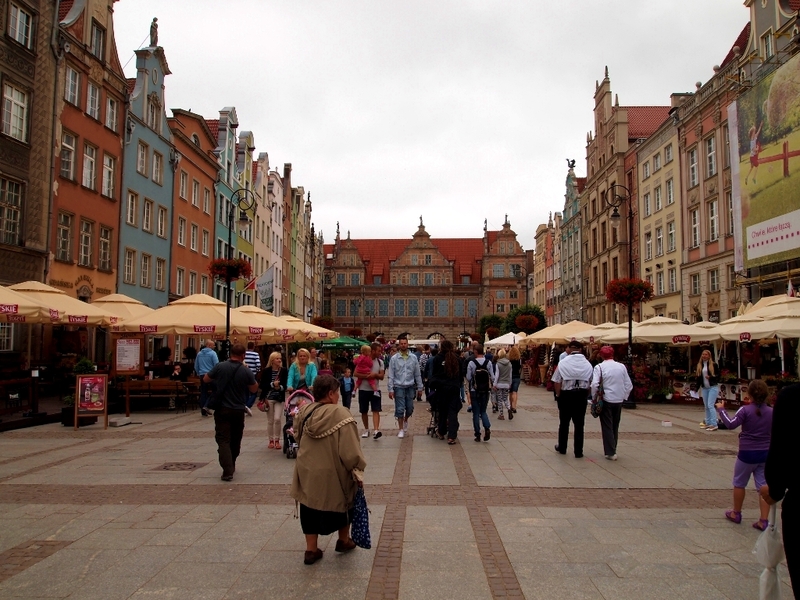 Gdańsk was the first [and at this point only] city I’ve visited in Europe that lacks a main square or town square. I found this a little strange – I’d become used to there being a central square where all the action is, and Gdańsk failed me here. 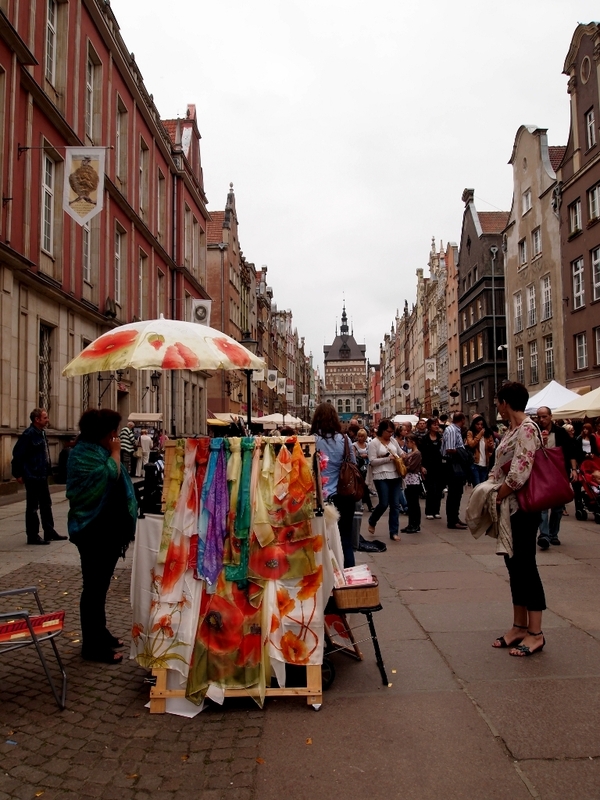 However, once you visit the main street, ul Długa, you don’t think too much about the lack of a main square. This street is special, huge, and has everything you might want in a square…only it’s quite a bit longer. The buildings lining the street look like perfect and brightly painted dollhouses, and there’s a big town hall about halfway down. This is the centre of tourist-town, but it’s also constantly filled with locals as well, so while you don’t feel uncomfortable walking around with your camera out, you also don’t feel as though you’re looking at something entirely fake. ul Długa is also the ‘royal way’, where kings traditionally paraded from south to north through various grand gates – the Upland Gate, the Foregate, the Renaissance Gate and finally the Green Gate, which brings you to the riverfront. Along the street are historic buildings, museums, restaurants, shops, ice cream stalls, street performers, people selling balloons, beggars and more. It’s exciting. During the day it’s marvellous, but at night it truly comes alive. I visited the Amber Museum, having tried unsuccessfully to visit one in Vilnius. It’s housed in the old Foregate, on multiple levels, and gives a good overview of the creation of amber, the history of amber use in the Gdańsk area, different kinds of amber, amber with inclusions [ie. insects, plants, lizards etc. ], how to distinguish fake amber, as well as galleries of amber art and jewellery. I thoroughly enjoyed it and will admit to hogging one of the touch-screen computers in there to enable me to find out more. The people I got evil looks from were people who had spent ages on the previous machine so I didn’t feel guilty – I’d had to skip that one, they could wait or miss this one. Some days I feel a little selfish. I tried to visit the archaeological museum, but it was closed…for another year or so. The Gdańsk History Museum permanently had a ridiculous line, as did the Maritime Museum, so I didn’t actually see much by way of museums. Still, wandering the city itself was so pleasant that I didn’t need to see a lot, and each time I’d meander through the streets I’d discover something different. Plus, with the St Dominic’s Fair starting the day after my arrival, there was plenty to do. Don’t apologise for the history lesson. You taught me something. 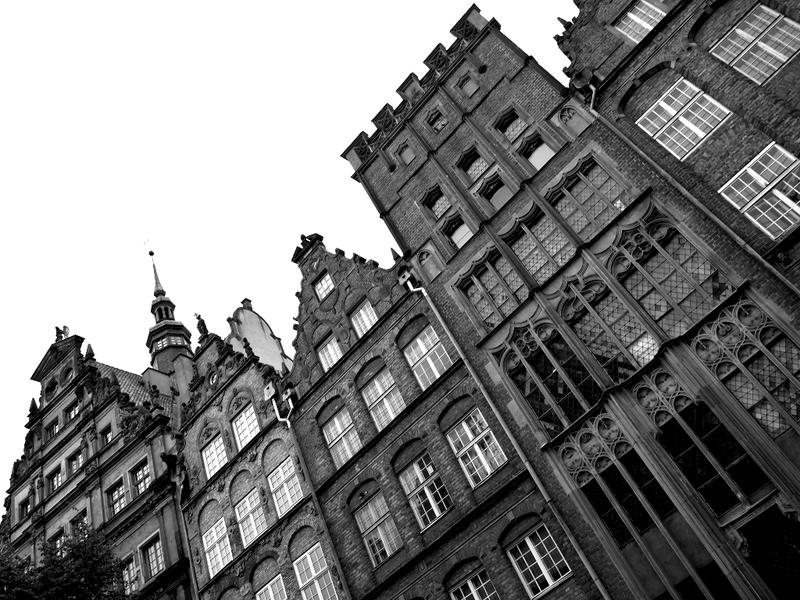 I had heard of Danzig before but didn’t know it was the old name for Gdansk. Very interesting. Photos are great as always. 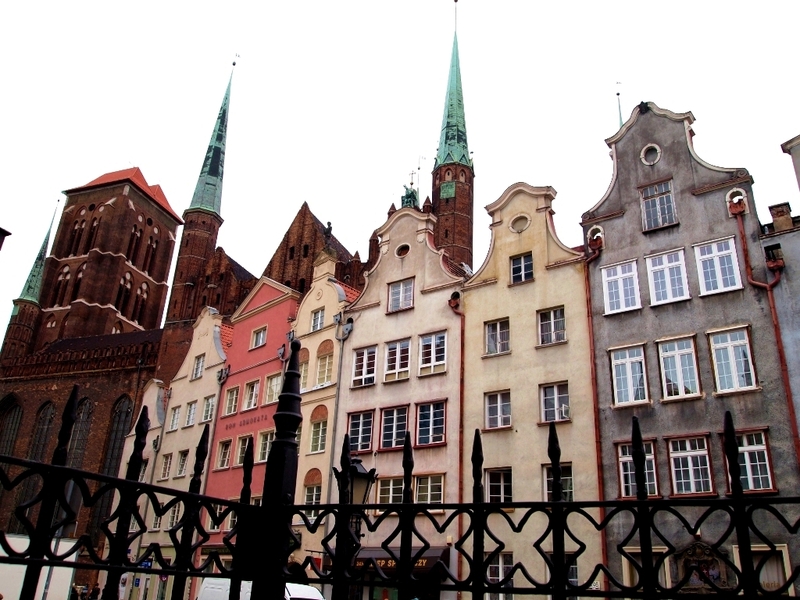 Oh Gdansk looks amazing! You have some gorgeous shots! I find it interesting how one city can at different times in History be Polish and German! What do people who live there say their nationality is? I suppose now they would say they were Polish but older generations could be either! How confusing! It is an incredibly gorgeous city! They say Polish – most Germans left/ were kicked out after the war, and large numbers of Poles migrated there.